Our system is called Open Enrollment – meaning you can enroll whenever it works best for your schedule! There are no registration deadlines and we won’t lock you in to any 6 or 8 week sessions. You can come as frequent or as infrequent as you wish! Our promise to you: No contracts… Ever! Whether you’re dropping in to a class for $20 or signing up for our All Access Membership Plan, you will not be asked to sign any annual contract. There are no registration or termination fees. There are no commissions either, so none of our staff will try to coerce you to buy anything that won’t work best for you! Monthly Plans – Best Value! Our Family Membership option not only gives our incredible families the freedom to choose which plan is best for each family member, it also frees up a lot of space in your wallet, too! Movement is best as a shared experience. Kids see their parents move and work through challenge and it inspires them to not become frustrated when times get hard. Parents see their kids having fun by trying new wacky things and become enlightened to the fact that it’s okay to be or do silly things – they find their playful instinct that so many of us lose as we age. Each individual family member gets to choose the best plan for them – we won’t force you to be on a higher tier, more expensive plan that your busy schedule won’t allow you to use, just because another family member wants it. The kids can be on 8x/month or All Access because they like to come to class several times per week while the parents can be on the cheaper, 5x/month plans – or vice versa! Our gym’s mission is to provide a welcoming, safe, and clean play space while also offering services and products that are not only top notch and educational, but also accessible to any budget. We do not believe in forcing people to sign contracts with hidden sign up fees or early termination fees. Our doors have stayed open for 8+ years not because we force our members to continue to pay through contracts, but because our program is just that good! Memberships are the most popular option not just because of their value, but also because they give you the access you need to see quick progress out of your investment. Unlimited Open Gym Access means you’ll get to put in the time your body requires to practice, train, and refine all the mechanics and skills you’ve learned in class. The minimum exposure most students need is 1 training session per week to see progress. 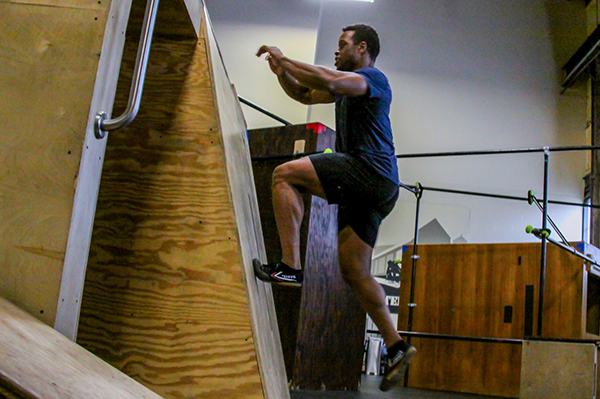 With Open Gym Access, you can increase that exposure to up to 5 training sessions per week on our Membership Plans! All you need to do is create an account on our registration page and then find the next class that fits your schedule. When you go to register for it, hit the “Free Trial” option and you won’t be charged! Our system is called Open Enrollment, which means that there are no 6 or 8-week sessions that you have to commit to in order to participate! You can start whenever you want and you can come as often or as infrequent as you wish. Anything comfortable that you don’t mind getting sweaty in! If you’re in the market for shoes, we have a couple different brands we recommend for best practice, but any pre-cleaned indoor shoes (that do not have plastic on the arch) will work. Do I need to pre-enroll? Yes, we require everyone to pre-enroll before coming to class. This is an important process for us because our instructors create unique curriculum for every class they teach. Pre-enrolling allows your instructor to know to expect you and they’ll tailor the curriculum to best suit your needs. Also, our Tiny Movers Classes are capped at 8 kids, Kids Classes are capped at 9 kids, and Youth and Adult Classes are capped at 10 students. If all slots have been taken by pre-enrolled students, we won’t be able to accept walk ins. My class is full, is there a wait list? As long as your account has an applicable pass for the service you’re enrolling for, you’ll be allowed to join the wait list. We very frequently enroll from our wait lists, so don’t feel down right away! If a space opens up, you’ll get an email notification and we’ll also shoot you a quick phone call to let you know that a space is available. Is there are cancellation policy?